Synopsis: Orthodoxy and life is very deep and complex, but the essence of Christian life is simple. The Gospel today teaches us a simple way, and if we obey the simple apostolic command, we will not be confounded. If we think too much, we will always be confused. We look at the calling of Nathaniel and the simple way he was told to approach his doubts; this applies to EVERY doubt and difficulty in our life. "Come and see!" is the only door to the triumph of Orthodoxy, that is, the fullness of the indwelling of God, in our hearts. John 1:43-51 43 The day following Jesus would go forth into Galilee, and findeth Philip, and saith unto him, Follow me. 44 Now Philip was of Bethsaida, the city of Andrew and Peter. 45 Philip findeth Nathanael, and saith unto him, We have found him, of whom Moses in the law, and the prophets, did write, Jesus of Nazareth, the son of Joseph. 46 And Nathanael said unto him, Can there any good thing come out of Nazareth? Philip saith unto him, Come and see. 47 Jesus saw Nathanael coming to him, and saith of him, Behold an Israelite indeed, in whom is no guile! 48 Nathanael saith unto him, Whence knowest thou me? Jesus answered and said unto him, Before that Philip called thee, when thou wast under the fig tree, I saw thee. 49 Nathanael answered and saith unto him, Rabbi, thou art the Son of God; thou art the King of Israel. 50 Jesus answered and said unto him, Because I said unto thee, I saw thee under the fig tree, believest thou? thou shalt see greater things than these. 51 And he saith unto him, Verily, verily, I say unto you, Hereafter ye shall see heaven open, and the angels of God ascending and descending upon the Son of man. “Follow me” and “Come and see” The simplest and most important instructions to live according to the Triumph of Orthodoxy. Synopsis:The "Triumph of Orthodoxy" is not only a historical event that we commemorate today, but also applies to every individual Christian. We spoke about the meaning of icons and the incarnation last night – the triumph of Orthodoxy for the individual is that, as one of the hymns teaches, because of the incarnation "the sullied image (of God, in us) has been restored to its ancient glory and filled with the divine beauty." 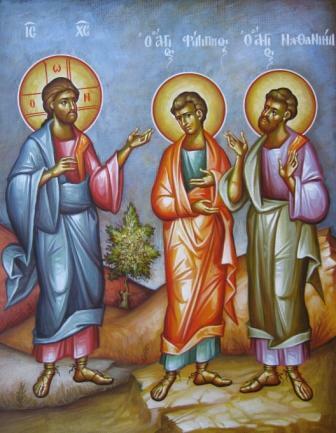 (http://www.orthodox.net/sermons/great-lent-sunday-01_2011-03-12+the-uncircumscribed-word-of-the-father-became-circumscribed+the-meaning-of-icons.mp3). The readings today teach us how to realize in our lives this promise, and the Gospel is short and succinct – the Lord commands us to "Follow me" and "Come and see" What does this mean practically for us.? The Uncircumscribed Word Of The Father Became Circumscribed. The Meaning Of Icons, from Vespers and Matins, Sunday of Orthodoxy. Synopsis:The true meaning of icons is proclaimed in the Sunday of Orthodoxy Services. The "surface meaning" of an icon is that we can depict Jesus Christ as a man precisely because He became a man. We are not satisfied with such a shallow explanation, and the services delve much deeper into the meaning of the incarnation. Two examples, one from Vespers, and the other from matins, describe the wonder of the incarnation. Every time we gaze upon an icon, we must remember that we, who have nothing in common with God, can know God because He chose to have everything in common (one hymn, below, describes this as the God-man taking on all the "distinctive properties" of our flesh), with us, save sin. keep us from doing that which is forbidden, and from an idle tongue and mind. give us strength to fight off the passions, and make us mighty in the war against sin. By alienation from passions, prepare us to follow Thee, Who hast shewn us victory over the devil through fasting, so that we may become partakers of Thy death and Resurrection, and be nourished by Thine eternal sweetness, which Thou hast made ready for them that hunger and thirst for Thy righteousness. Strengthen Thy community by fasting and by faith in Thee, and grant strength against the onslaught of enemies. For Thou art the God of mercies, and to Thee belongeth glory, together with the Father and Thine All-Holy, and Good, and Life-creating Spirit, now and ever, and unto ages of ages. Amen. You are currently browsing the archives for the Sunday of Orthodoxy category.